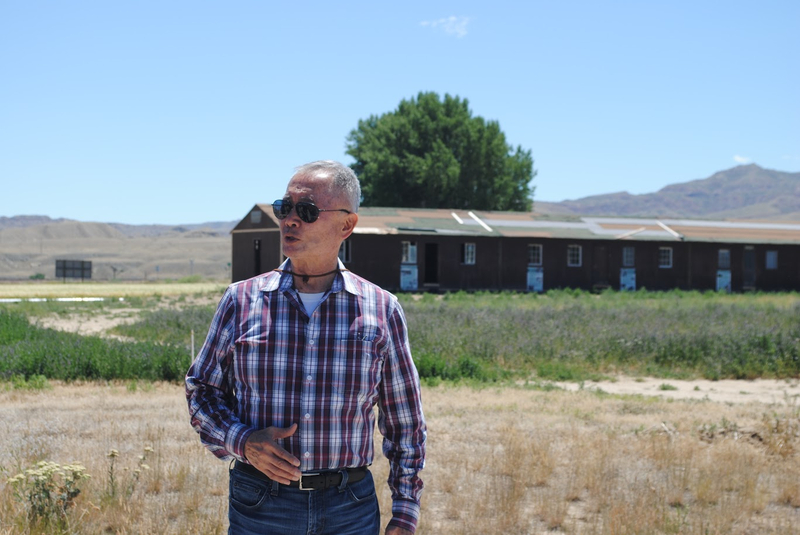 George Takei stands in front of the barrack at Heart Mountain. POWELL, Wyo. — George Takei, an actor, activist, and social media star best known for his portrayal of Mr. Sulu in the acclaimed television and film series “Star Trek,” made what he called a “pilgrimage” to visit the Heart Mountain World War II Japanese American Confinement Site in Powell, Wyo., on July 12. George Takei with HMWF Executive Director Brian Liesinger. Takei was one of nearly 120,000 Japanese Americans removed from their homes and confined behind barbed wire during World War II. He and his family were held at Rohwer “War Relocation Center” in Arkansas and later transferred to Tule Lake in Northern California. He compared his recollections of incarceration, rekindled by the Heart Mountain visit. The Heart Mountain Interpretive Center on the National Historic Landmark site preserves one of the ten confinement sites where Japanese Americans were unjustly incarcerated. On the high plains of northwest Wyoming, 14,025 people — two-thirds of whom were U.S. citizens — were held in what was the third-largest community in Wyoming at the time. On the site today the Interpretive Center, military memorial, walking trails, and original structures are operated and cared for by the non-profit Heart Mountain Wyoming Foundation (HMWF). 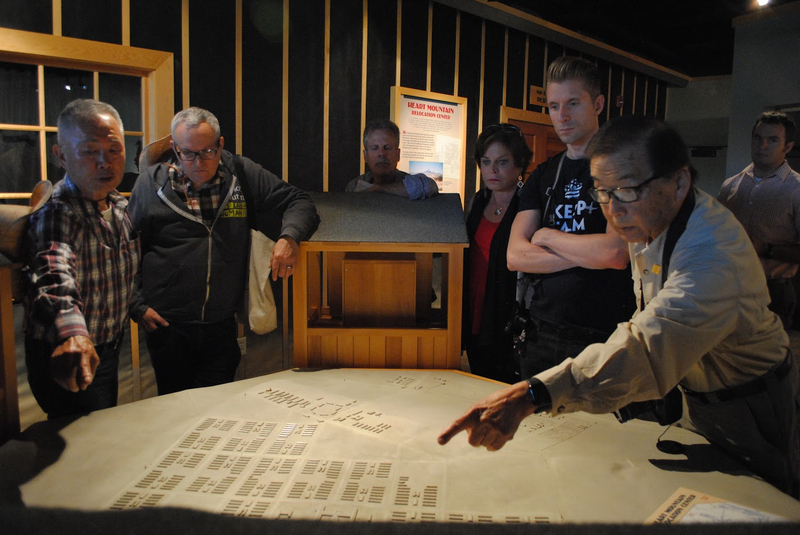 George Takei and HMWF board member Sam Mihara discuss the map exhibit at the Heart Mountain Interpretive Center. Takei recently starred in the award-winning Broadway musical “Allegiance,” which was set at Heart Mountain. The musical explores the draft resistance movement that was an essential part of the legacy of the camp, where 63 men were sent to federal prison for standing up to their own government. That connection prompted Takei to make the trip to Heart Mountain accompanied by the writers and producers of “Allegiance,” as well as his husband, Brad. In addition, three HMWF board members, two of whom are former Heart Mountain incarcerees, were present to provide context. One of the board members, Takashi Hoshizaki, was himself a resister, spending two years in federal penitentiary following his trial. Takei was impressed with the bravery Hoshizaki showed in the face of injustice. “You’re a hero,” he told him. “These men are heroes, my personal heroes,” Takei said, referring to the Heart Mountain resisters. Brad and George Takei in the Heart Mountain theater with Heart Mountain Wyoming Foundation board member Takashi Hoshizaki. Hoshizaki would later serve during the Korean War as a medic. Takei went through the Interpretive Center’s exhibits as well as the other structures and features of the site, including an original root cellar, the memorial to the those Heart Mountain men and women who served in the U.S. military, an original barrack from the camp, and the remaining hospital buildings. The group was also guided by former incarceree and HMWF board member Sam Mihara, who was nine years old when he was sent with his family to Heart Mountain. 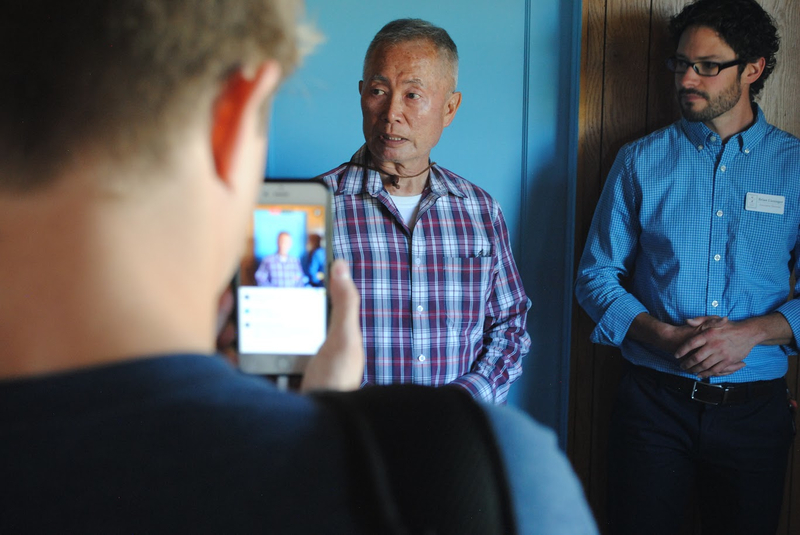 George Takei in the replica barracks at Heart Mountain. 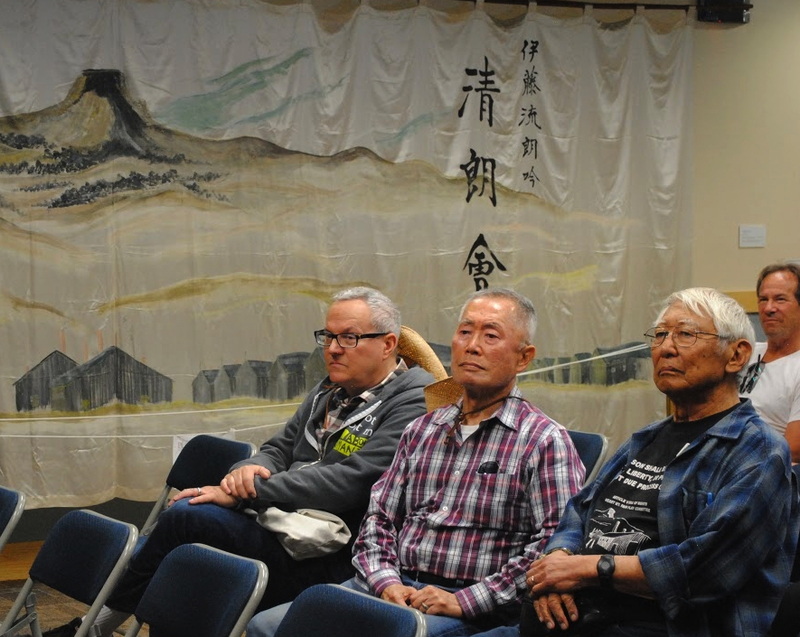 Aura Newlin, also an HMWF board member, explained the importance of Takei’s visit. “The power that George Takei’s persona offers is tremendous, especially through social media exposure. He did a live stream on Facebook and we were tracking the viewers, and it just was getting higher and higher,” she said. “That is a viewership we do not have the capacity to reach on our own. Somebody with his clout sharing a historic site important to all of us is immensely valuable. For more information, call (307) 754-8000 or visit www.HeartMountain.org.